In textile manufacturing processes exhaust air purification can be seen as a particular challenge. Especially exhaust air caused by the application of stenter frames requires a highly efficient separation since the emerging waste air is odour-intensive and made up of wax, oil and fibre particles. Depending on the production location textile producers are faced with strict regulations in terms of emission limits for stenter frames. The application of stenter frames is in the field of textile finishing for fabric heat treatment (woven to knitted fabrics) where the fabric is not only dried but also subject to thermo-fixation. The operating temperature can be up to more than 200°C depending on the actual production mode and fabric. For its operation the stenter requires a high consumption of electrical energy (e.g. for motors and ventilators) as well as a high consumption of heat – as intake for the cost intensive gas and thermal oil heating. When faced with polluted exhaust air derived from a stenter an unsuitable filter cell would wear out rapidly and entail high cost for filter exchange or replacement. In addition to that the exhaust air of the stenter frame contains valuable heat which can be utilised for subsequent processes. With the ULTRAVENT® exhaust air filter system KMA Umwelttechnik delivers an economical and energy efficient solution for stenter frame exhaust air purification. The exhaust air is profoundly purified by the KMA electrical filter cells before being led into the atmosphere, to avoid nuisances and the emission of pollutants. The exhaust emissions of the production facilities are diminished and external nuisance resulting from air pollution is eliminated. The strict European provisions and regulations serve as benchmark for minimised emission limits. By means of the integrated heat recovery system the exhaust heat is efficiently recuperated for the utilization in subsequent processes. The heat derived from the hot exhaust air can be utilized for the supply air heating which is feeding the stenter frame. Through this efficient heat recovery the operating costs of the stenter frame can be radically reduced due to lower expenses for the conventional heat supply (expensive gas and thermal oil heating). At the same time the recovered heat can be utilized for water heating employed in other production areas (dye house or laundry). The KMA exhaust air filter system operated with an integrated cleaning system. 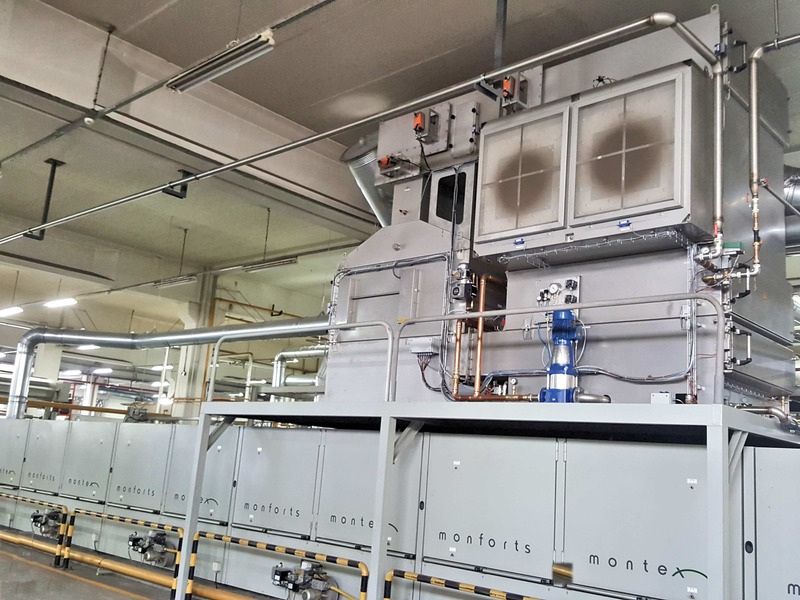 The automatic filter cleaning system allows for a regular cleaning of the filter modules while ensuring the full effectiveness of the filter and heat recovery modules. KMA filter use the valuable heat out of the extract air and reduce the energy consumption of your production facility by means of heat recovery. How to lower the energy costs of your stenter frame is explained in the following case study. KMA ULTRAVENT® systems are available in three sizes with a filter exhaust air capacity of 10,000, 15,000, 20,000 and 30,000m³/h. For larger exhaust air volumes two or more KMA systems can be easily connected to each other. The KMA exhaust air systems are assembled on a modular system, which combines several system´s components.Therefore ULTRAVENT® system allows a precise adaptation to the needs of the stenter. According to the customer´s request each system can be equipped with several heat exchanger modules. Thus, a KMA exhaust air system with three heat exchanger modules and two electrostatic filter stages is a common example. Depending on the quantity of equipped module elements the height of the KMA system varies. With a fully equipped KMA ULTRAVENT® the maximum height can be up to 4.4 m. Is there not enough spatial height given in the plant, the tandem model can be selected instead of the KMA standard tower version. For the Tandem model the modular units are divided into two housings, which are connected to each other. In this case, the overall height of approximately 3.5 m is not exceeded. Here, both housings are sharing one automatic cleaning system. The tandem module for the transfer of thermal energy to air and water. The tower module utilizes the recovered heat for process water heating. With the energy saving KMA tandem module the recovered heat can be utilized to heat up supply air and process water. As a result, the overall energy consumption of the stenter is reduced, since less energy from the cost intensive conventional heating methods such as gas or thermal oil heating is required. KMA exhaust air filter in the tandem module are equipped with electrostatic filter cells for particle separation, heat exchangers for heat recovery, an automatic cleaning system for the cleaning of the filter modules and optionally UV-light for odour separation. The KMA tower module employs the recuperated heat from the exhaust air for the heating of process water. Consequently, the overall energy consumption for water heating used in the dye house or laundry facilities is decreased. KMA exhaust air filter in the tower module are equipped with electrostatic filter cells for particle separation, heat exchangers for heat recovery and an automatic cleaning system for the cleaning of the filter modules.